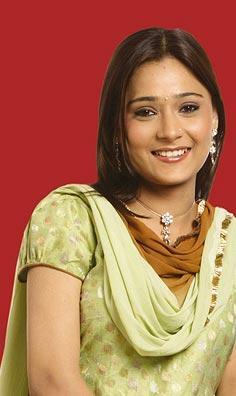 Rediff.com » Movies » Wild days ahead on Bigg Boss 4! 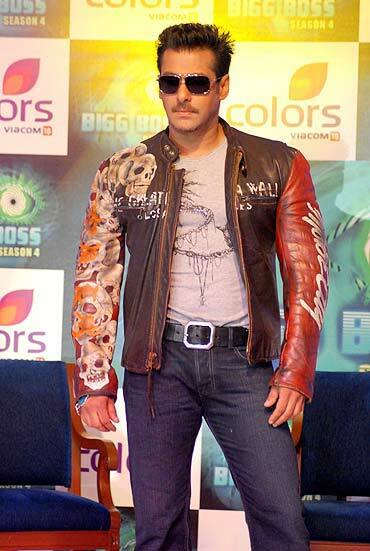 Wild days ahead on Bigg Boss 4! Like them or not, reality shows are here to stay. And it's a definite in the case of the increasingly popular and unabashedly voyeuristic Bigg Boss, season 4. After the likes of Arshad Warsi, Shilpa Shetty and Amitabh Bachchan, it's Salman Khan's turn to boost the show's TRPs with his characteristic candour and cheek. Currently high on the roaring response to Dabangg, the superstar was clearly in his element and appeared to be having a ball. Be it dancing to his chartbusting hits from Dabangg, Wanted and Bigg Boss 4's brand new theme or plugging his latest success at every possible chance. Often amused while observing the interactions inside the house, Chulbul Pandey kept the atmosphere fun and floored everyone even while confronting or teasing the celebrity housemates with uneasy questions. Following his Bollywoodish entry featuring him on bike-chopper-cycle, the denim-clad Khan offers the viewers a step-by-step tour inside Bigg Boss' residence calling it 'Yeh ghar koi mandir nahi, maidan hai...jung ka maidan.' The house now has an even more vibrant and colourful palette of banana greens and lemon yellows with a touch of fuchsia, aqua and purple thrown in good measure. There's also a lavish gym, swimming pool, open kitchen, spacious living room and dining area, a pyramid-inspired confession room and a curiously titled delight room. Only this time all the contestants -- girls and boys will be sleeping in the same room, wherein there are seven double beds and one single bed. The format remains the same with a couple of tweaks here and there -- 14 participants locked in a house for a good 96, instead of the usual 84 with over 30 cameras to capture their every single move. Soap star Shweta Tiwari in a fringed gold bustier and harem pants shows off some glamorous moves to a medley of Aao huzoor (Kismat), Ranjha Ranjha (Raavan), Mehbooba (Ram Gopal Varma Ki Sholay). The lady gets the actor to plug Dabangg still further with his rendition of Tere mast mast do nain in praise of her big brown peepers. Daughter Palak then joins the camaraderie to gift mommy a set of pink plush bears so that she can squeeze them in her absence. Safely, there is no mention of estranged husband Raja, a former Bigg Boss 2 contestant. She appears a balanced mix of friendly and no-nonsense. 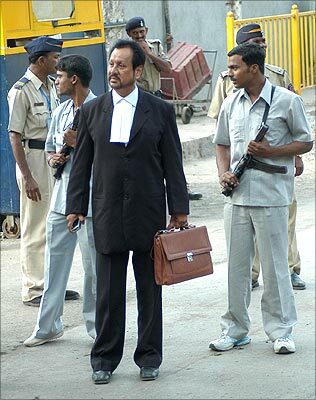 Abbas Kazmi, an advocate best-known for handling Mohammad Ajmal Kasab's case, one of the key accused in the 26/11 terror attack on Mumbai. The ever-smiling, amiable lawyer calls himself 'khatron ke khiladi' and with good reason. And going by his sympathetic behavior towards most of the contentious folk within the house, this guy seems unlikely to come out any time soon. Model and actor Sameer Soni, the actor who recently played a passionate filmmaker modeled around Karan Johar in the latter's production I Hate Luv Storys describes his journey from Wall Street to Film City as quite an interesting one. Although, his polish and slightly condescending expressions may not go down well with the not-so-sophisticated fellas and there's a possibility he may get singled out as a snob. 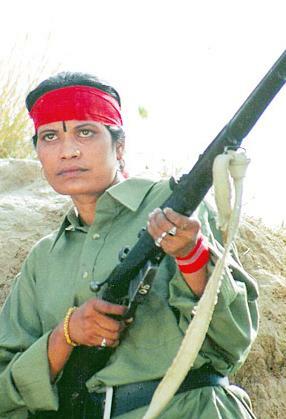 Reformed dacoit Seema Parihar is easily one of the most intimidating members of the house. Surprisingly unapologetic about her criminal past, Parihar is comfortable in her skin and costume, which seems to take inspiration from Tantri-the Mantri's attire. With three cases still pending on her name, this Chambal bandit appears to be a connoisseur of stark stories. No wonder there's a movie about her life story, namely Wounded. Better known as Amisha Patel's brother -- Ashmit who's yet to find success in Bollywood makes his way inside the house after flexing his biceps to London Dreams' Barson barson yaaron. His goal, while at it, is to make friends and embrace everyone as his family. Noticing how he went about doing a porter's duties around model Anchal Kumar, he's quite a ladies' man. 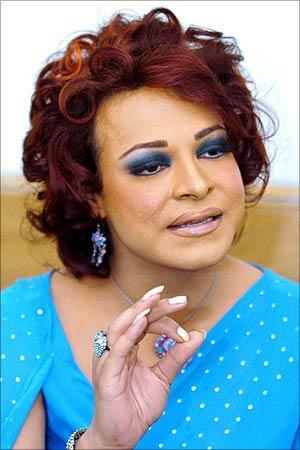 Speaking of which, up next Begum Nawazish Ali aka Ali Saleem, a cross-dressing television host from Pakistan flutters her eyelashes and shoots on her one-liners about how everyone digs a 'buy one, get one free' situation to explain this two-in-one stand causing Salman to break into a manic giggle. For all her enthusiasm and etiquette, the housemates are wary of being friends with this two-tone personality. Winner of MTV reality show, Splitsvilla 2, Sakshi Pradhan shakes a leg and then flaunts some made-up air and wannabe attitude to unimpressive results. Devender Singh aka Bunty Chor, a moniker he's reluctant to acknowledge is the inspiration behind Abhay Deol's character in Dibakar Banerjee's acclaimed Oye Lucky Lucky Oye. The man's pretty uptight alright! And even Salman's easygoing charms fail to loosen him up. It's no surprise that all his fellow housemates nominate to vote him out on Day One itself. Too bad it turns out to be a trick and he's appointed captain with benefits instead. Lucky, indeed. 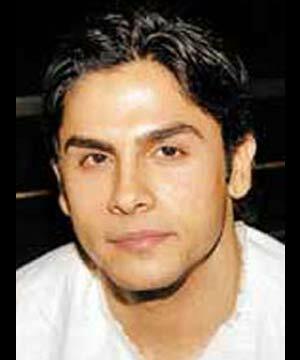 Filmmaker Mahesh Bhatt's seriously beefy son, Rahul, a physical trainer aims to impress and prove he's a case of unfair victimisation. Come again? Well, he got embroiled in the 26/11 investigations owing to his proximity with one of the accused David Coleman Headley. One look at those bulky biceps is enough to not want to be in the bad books of this guy. Perky television actress Sara Khan, like most women in the studio, starts out flirting with a clearly pleased Khan and then bids a fond farewell to her cute pooch before entering the house with high hopes and big broad grin. Model Aanchal Kumar sashays in an electric purple gown and comes across way too demure and dainty to last long in the brewing madhouse. 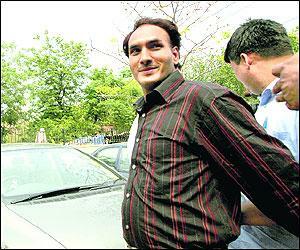 Ditto for another model Hrishant Goswami, a Gladrags Manhunt 2004 winner. The handsome bloke is one of the sweet, sincere types. Perhaps he could be the Zulfi Syed of this season? The influx of notorious celebrities continues with the entry of Veena Malik, a Pakistani actress who presented evidence of former boyfriend and cricketer Mohammad Asif's participation in a match-fixing controversy. Her agenda is to reveal her true self to the world. Well, that's not going to be hard if the crowd inside is any indication. At last, it's time for the final contestant, Bhojpuri actor and singer Manoj Tiwari to make a dhoti-clad song and dance entry. The humility personified star expresses gratitude to his fans for voting him popular enough to have a stamp in Netherlands issued after him. 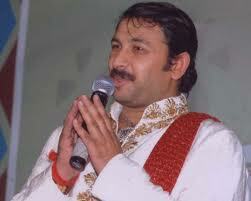 Hopefully, those very fans will vote for his long stay in Bigg Boss' house as well. It will be fun to see how Salman Khan intermingles with this motley mix. Clearly, there's a lot in store. From the looks of it: cat-fights, ego tussles, groupism and losing temper over petty issues galore. Does Bigg Boss promo score over KBC?